QUALIFICATIONS/CERTIFICATIONS: Over 8 years of Professional Nanny Experience (babysitting, tutoring, etc.) Valid Passport (in progress) Certified in CPR/First Aid & AED Able to prepare healthy meals Reliable vehicle and clean driving record Experience working with all different age groups BIO: Bernadette is a lifelong Angelino and a passionate professional in the area of childcare. She has been around children and teens of many different families for the past 13 + years. She has experience working with children from infancy to 15 years old, including children with special needs. 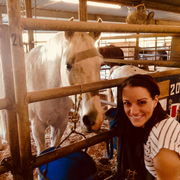 She has worked with children and adults with disabilities at the Shadow Hills Riding Club in their Hippotherapy Program, and with the Sunshine Kids in Los Angeles (an organization dedicated to kids with cancer). She has an immense passion for children and animals; she loves seeing the good in everyone and bringing people joy. Bernadette has spent much of her professional life Read more as a musical theatre actress, singer, and dancer, and is now switching gears and looking for a full time childcare position. A performer from the age of 6, she is extremely passionate about music and how important music is for people, especially children. Bernadette has 5 + years of teaching/tutoring experience. She is trustworthy, punctual, loyal, honest, and light-hearted, with a flair for comedy. In her spare time, Bernadette enjoys high intensity interval training, piyo, hiking, dancing, volunteering, photography, juggling, playing her guitar, and educating herself about the organic lifestyle. She is an avid dog lover and has two Maltipoos, Buddy & Gracie. Bernadette doesn't have any reviews yet.